Few Bar or Bat Mitzvah celebrants share $5000 dollars of their gifts by” Lighting the Way” at the Sarah Wetsman Davidson Hospital Tower. But that’s how Davina Saks elevated her coming-of-age ceremony. 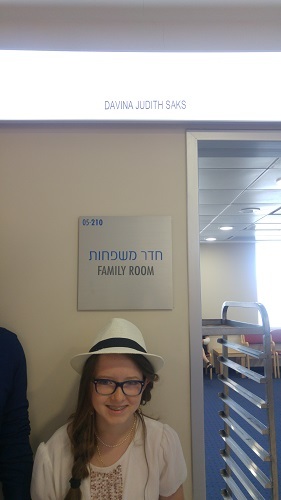 She is pictured on the fifth floor of the orthopedics department of the SWD Tower below the” Lighting the Way” plaque that bears her name.